Vest Chains are available in a variety of styles to suit your club's needs. Men's Vest chain in .925 Sterling Silver with Heavy Rolo Chain. 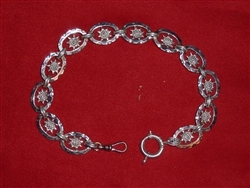 Men's Watch chain in .925 Sterling Silver Swivel and Spring Ring available in two sizes: 10 inch (shown) and 12 inches.